Any communication designed to raise awareness and produce a desired effect. An advertisement may occur through any medium, be that print, broadcast, imagery, or even word of mouth. Many advertisements are basic; for example, there may be a radio announcement to "buy X." Others are more complex, encouraging purchase by stating a product has a better price and/or better quality. Many advertisements are intended to entertain. They are an integral part of marketing. Informally, an advertisement is called an advert or an ad. A means by which a seller of a BRAND of good or service attempts to increase its sales by communicating with BUYERS, informing them of the nature and attributes of the brand and persuading them to buy it in preference to competitors' brands. Advertising comprises part of a firm's PROMOTIONAL MIX and is undertaken in a variety of ways, including the use of mass MEDIA channels such as television, national newspapers and magazines, posters, websites etc., and more targeted approaches through ‘special interest’ magazines and trade journals, and regional and local newspapers. Although some advertising is largely concerned with providing buyers with information about the product, the majority of advertising is ‘persuasive’ in intent. Persuasive advertising aims to encourage consumers to purchase products, and the skill of advertising copywriters lies in designing ADVERTISEMENTS which are visually attractive and which appeal to deep-seated consumer motivations, both physical and psychological. If advertisements appeal sufficiently to consumer motives they will encourage repeat buying of the product, thereby establishing BRAND LOYALTY and increasing or maintaining the firm's MARKET SHARE. The selection of the advertising medium will depend upon the MARKET or market segment which is being targeted (see MARKET SEGMENTATION) and the relative costs and effectiveness of using different media. For example, in respect of specialized INDUSTRIAL BUYERS advertisements may be placed in appropriate trade/professional journals. On the other hand, if large numbers of final consumers are being targeted, it may be more cost-effective to use the mass media which, although more expensive in absolute terms, actually costs less per potential customer reached. Advertising is an important part of a firm's MARKETING MIX which seeks to differentiate its brand of product from competitors' offerings. See ADVERTISING COPY, ADVERTISING COVERAGE, ADVERTISING EFFECTIVENESS TEST, ADVERTISING FREQUENCY, DIRECT MARKETING, PRODUCT DIFFERENTIATION, COMPETITIVE ADVANTAGE, ADVERTISING CAMPAIGN, ADVERTISING OBJECTIVE, BUYER BEHAVIOUR, PRODUCT IMAGE, ADVERTISING STANDARDS AUTHORITY, CONTROL OF MISLEADING ADVERTISEMENTS REGULATIONS 1988. Fig. 3 Advertising. (a) The static market effects of advertising on demand (D). 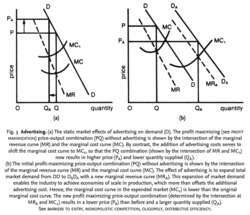 The profit maximizing (see PROFIT MAXIMIZATION) price-output combination (PQ) without advertising is shown by the intersection of the marginal revenue curve (MR) and the marginal cost curve (MC). By contrast, the addition of advertising costs serves to shift the marginal cost curve to MC1, so that the PQ combination (shown by the intersection of MR and MC1) now results in higher price (PA) and lower quantity supplied (QA ). (b) The initial profit-maximizing price-output combination (PQ) without advertising is shown by the intersection of the marginal revenue curve (MR) and the marginal cost curve (MC). The effect of advertising is to expand total market demand from DD to DADA with a new marginal revenue curve (MRA). This expansion of market demand enables the industry to achieve economies of scale in production, which more than offsets the additional advertising cost. Hence, the marginal cost curve in the expended market (MC1) is lower than the original marginal cost curve. The new profit maximizing price-output combination (determined by the intersection at MRA and MC1) results in a lower price (PA) than before and a larger quantity supplied (QA). a means of stimulating demand for a product and establishing strong BRAND LOYALTY. Advertising is one of the main forms of PRODUCT DIFFERENTIATION competition and is used both to inform prospective buyers of a brand's particular attributes and to persuade them that the brand is superior to competitors’ offerings. There are two contrasting views of advertising's effect on MARKET PERFORMANCE. Traditional ‘static’ market theory, on the one hand, emphasizes the misallocative effects of advertising. Here advertising is depicted as being solely concerned with brand-switching between competitors within a static overall market demand and serves to increase total supply costs and the price paid by the consumer. See BARRIERS TO ENTRY, MONOPOLISTIC COMPETITION, OLIGOPOLY, DISTRIBUTIVE EFFICIENCY. This is depicted in Fig. 3 (a). (See PROFIT MAXIMIZATION). The alternative view of advertising emphasizes its role as one of expanding market demand and ensuring that firms’ demand is maintained at levels that enable them to achieve economies of large-scale production (see ECONOMIES OF SCALE). Thus, advertising may be associated with a higher market output and lower prices than allowed for in the static model. This is illustrated in Fig. 3 (b). Because the academic and athletic programs of several larger neighboring districts also posed a threat, Masterson hired New Media Associates, an advertising firm in nearby Amesbury. Scott Stringer may consider scaffold advertising a "blight," but these stores have few other effective ways of luring customers into their establishments while they're being refurbished. The policy contained an advertising injury provision whereby Transportation agreed to defend and indemnify Teletronics against third-party claims for damages caused by Teletronics "in the course of advertising [its] goods, products or services. Your company and its advertising agency are like ships passing in the night. As discussed more fully below, the four sections of rule 206(4)-1(a)(1)-(4) establish specific restrictions on adviser advertising. Because most vendors offer cooperative advertising allowances through their trade discount programs and taxpayers view this allowance as a rebate or discount, the treatment of these amounts has raised issues. As with poetry and painting before it, advertising has also moved from mere communication into the world of art. We still have this apartheid system in the advertising industry that is very resistant to the notion that black-owned agencies can work outside the niche," she says. For three decades the debate over tobacco advertising has been driven by such concerns. Cowboys, camels, and kids: does advertising turn people into smokers? RJR Nabisco, the giant food-and-tobacco conglomerate, canceled an $80 million contract with a New York advertising agency that produced ads for Northwest Airlines' no-smoking policy. advertising works in virtually every market and at every sales point. Because it is illegal to sell cigarettes to minors, the government can prevent advertising to minors. Give them liberty to give us death?